ROI360 is an artwork creation and brand management solution designed to help creative agencies, printers and marketing teams streamline the artwork creation process with a catalog of branded artwork templates, simple editing tools and granular approval chains, plus a branded portal, budget control functionality, and access controls. ROI360's technology aims to help users produce artwork on-demand, enhance marketing productivity, and build a strong brand image. ROI360’s catalog of branded templates enables users to produce any type of artwork including posters, leaflets, business documents, and business stationery as well as social media graphics, digital displays, banners, point of sale materials, and more. 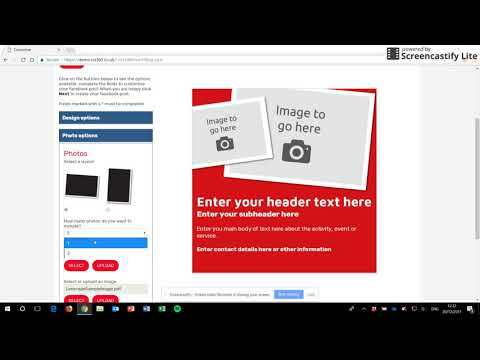 Users can convert their static artwork into editable online templates, then customize the images and text to their requirements. ROI360’s editing tools allow non-designers to adapt artwork templates, and edit images, text areas and layouts easily. Users can control their artwork with a library of brand approved images, free text entry, and sizing tools. User management technology, plus granular approval chains, watermarks, and PDF restrictions help control which users can access artwork. Approval chains mean multiple team members have to approve artwork before it is either created or printed. ROI360 provides users with their own branded portal, complete with relevant colors and logos. The ROI360 portal is automatically responsive, giving users the flexibility to access and manage their content on the go, from tablets and smartphones. An API allows users to integrate conveniently to their intranet, CRM, or other internal systems. ROI360 supports budget control, payments and printers, allowing users to download high resolution artwork, link with print providers, and procure merchandising items. Integration with Sage Pay enables users to accept secure credit card payments. ROI360 also supports web-to-print processes with quoting, payment confirmation, and pre-press management tools, plus order creation and job status notifications. As Marketing Manager I promote and approve all activity on Right Market for our company. I currently take on everything promotional-wise for the galleries, from brochures / invitations for new product launches, artist appearance and exhibitions to the mailing data used to market the event, and the POS to support the event. (Plus 'POS solutions') Whether that be in house or working with external sites to promote an event or encourage / increase footfall. Anything and everything that is being placed on a gallery wall or plinth that is not a painting or a print comes through me. Including how it should be displayed. Anything customer facing, such as gift vouchers, comp slips and business cards to the aftersales pack (websales included), this is all written and briefed in to the studio by me. Since using the software, our work load has eased, the galleries have also benefited from quicker turn-around for promotional material such as business cards or comp slips. Everything has been consistent across the estate. All price tickets, bios and nameplates now look exactly the same. Errors on pricing have also been eliminated as they all work from a central spreadsheet that can be uploaded to the software. It has also opened more doors to help me enforce our luxury retail status, making sure it's all on brand and printed to a high standard through ROI360's print partner Acorn Press. Currently there is not much that I don't like, if I was being picky I would remove a few extra steps from the process to streamline it for the galleries. I have been using ROI360 Storefront for a range of client interfaces for 4 years. We used the software to give clients an easier way to order rather than e-mailing files and instructions. This has saved us a huge amount of time and allowed us to provide a much faster and more reliable service. The software has also allowed us to win new business because of what benefits it can bring to customers streamlining their own processes.The platform is very easy to set up and maintain and offers a very robust solution once in place for the end user. As a SAAS model the uptime is excpetionally good and the support team is fast and knowledgeable. The platform is very easy to set up and maintain and offers a very robust solution once in place for the end user. As a SAAS model the uptime is excpetionally good and the support team is fast and knowledgeable. There are some limitations when it comes to flexibility in offering a different type of interface to different markets or customers. But if you use the strengths of the platform to build specific solutions for key customers then it t is not an issue. The site is quick and easy to use, saving us time and money. - Saves designers time - Ensures brand consistency globally - Allows staff to understand the brand and any constraints within it - Incorporates a PO process allowing the company to keep track of all expenditure - A site that we can consistently add products to to help various teams around the business - The software is saving designers time by creating templated products that are regularly ordered within the business. - Members of staff internally feel more involved with the brand when they get to experience it for themselves. - We are now starting to add products on to the system on a global scale, which is going to be a massive help for our designers around the world. - The software is enabling us to implement brand consistency all around the business. - The customer service team at ROI are fantastic, and always on hand to help out whenever needed. - The software is saving designers time by creating templated products that are regularly ordered within the business. - Members of staff internally feel more involved with the brand when they get to experience it for themselves. - We are now starting to add products on to the system on a global scale, which is going to be a massive help for our designers around the world. - The software is enabling us to implement brand consistency all around the business. - The customer service team at ROI are fantastic, and always on hand to help out whenever needed. It has provided us the ability to add a whole new dimension of marketing support to our dealer network.Storefront has enabled us to gain an advantage over our competitors. It is intuitive to use and provides many features (such as the resizing of PDFs) that we've not seen anywhere else. Without question, the deployment of storefront to our dealer network has helped us increase brand awareness and the overall reach of our marketing campaigns. Storefront has enabled us to gain an advantage over our competitors. It is intuitive to use and provides many features (such as the resizing of PDFs) that we've not seen anywhere else. Without question, the deployment of storefront to our dealer network has helped us increase brand awareness and the overall reach of our marketing campaigns. At times, the admin area is difficult to navigate. However, after a while of using the software, we can usually overcome any difficulties we face. There is also good aftersales support available from ROI360. I have been working with ROI for many years and always find them helpful. Standard support is answered and resolved quickly. We do tend to push the software to it's limits, when asking can the software do this or asking for new feature requests we usually get a quick reply, the answer is not always yes and the request is referred to development to investigate if it can be done and we don't hear back. Ability to create bespoke sites which can integrate with different MIS systems. PDF composition engine is tried, tested and robust. Complex flex rules and automatic page creation. Ability to create bespoke sites which can integrate with different MIS systems. PDF composition engine is tried, tested and robust. Complex flex rules and automatic page creation. Font management could be easier. Automatic notification of extension updates would be nice. Contact ROI360 directly for detailed pricing information. A catalog of branded templates enables users to produce any type of artwork including posters, flyers and business documents, as well as social media graphics, banners, business stationery, and more. ROI360’s editing tools allow non-designers to customize artwork images, text areas and layouts quickly and easily. Users can set up approval chains so that artwork needs to be approved by more than one staff member before it is created or printed. The ROI360 portal is automatically responsive, giving users the flexibility to access and manage artwork anytime, anywhere, from any mobile device. ROI360 allows users to localize and personalize their marketing materials, while simultaneously controlling their brand and tone of voice. Below are some frequently asked questions for ROI360. Q. What type of pricing plans does ROI360 offer? Q. Who are the typical users of ROI360? Q. What languages does ROI360 support? Q. Does ROI360 support mobile devices? Q. Does ROI360 offer an API? Yes, ROI360 has an API available for use. Q. What other apps does ROI360 integrate with? Q. What level of support does ROI360 offer?